Contoured medium back task operator chair. Mid back posture contoured airflow mesh back rest. Fabric upholstered seat with waterfall front. Fully reclining seat can be locked in upright position. Heavy duty gas lift for up to 25 stone. Chairs are important to get right, you should consider what tasks a person will be doing and what type of chair you will require to ensure the user is comfortable and can work in a healthy position for their body. Our coloured back mesh operator chairs are ideal for modern offices and they have fabric upholstered seats with a waterfall front. They also have a mid-back posture contoured airflow mesh back rest which keeps the users back in a healthy position and keeping it cool on hot days or in generally hot environments. A heavy duty gas lift with a capacity of up to 25 stone makes these chairs suitable for most individuals and a fully reclining seat can be locked in an upright position, both features contribute to easily tailoring the position to the users requirements. There are four colours to choose from; black, black/green, black/orange or black/raspberry. 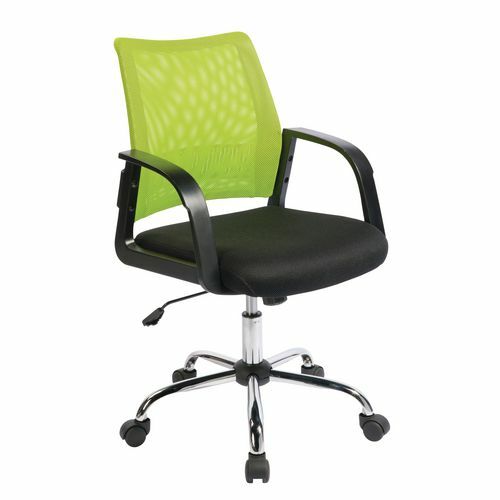 Our coloured back mesh operator chairs are great chairs to support your employees while they are performing tasks and they are ideal for a modern working environment. They are available with a 12 month guarantee and FREE UK Delivery.